Bay Tower is another residential multi-storey building, consisting of 28 levels with a duplex penthouse on the top, overlooking Beirut seafront. 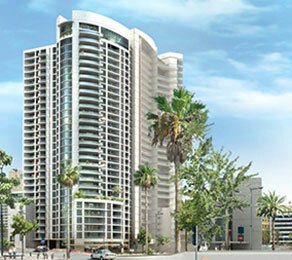 After the success of Beirut Tower as a residential development and, despite the world economic and real-estate crisis that broke out in late 2008, the developer decided to proceed with a similar project. The same team was employed (consultant, contractor and post-tensioning specialist), whilst again using this proven and successful structural method. The total construction area was near 37,000 m2,with an average floor area of 1,200 m2. All slabs were designed and built as two-way post-tensioned slabs using the CCL bonded flat-slab system. The large spans between columns, the rapid construction programme and the excellent results CCL achieved on the previously built Beirut Tower were the main reasons behind choosing the company’s post-tensioning systems for this project. Considering the large floor area, the main contractor decided to cast the slab in two pours in order to accelerate construction. This brought an additional difficulty to the structural design, which was complex because of the special slab geometry. However, the CCL Engineering team provided the technical solutions to these problems without any significant impact on cost or time. A casting cycle of nine days per level was achieved during construction.